Jupiter is the largest planet in our solar system and it rightfully represents expansion, abundance, luck, possibility, travel, risk, and opportunities. It multiplies anything it touches, for better or worse. As the myth goes, Jupiter is the son of Saturn, the ruler of hard work, discipline, and control. Saturn liked to eat his children out of fear, but Jupiter survived despite his father’s efforts. Jupiter teaches us that if you’re willing to work through the challenges and obstacles (Saturn), you will succeed and live to tell the tale. Virgo is the sign of personal heath, nutrition, diligence, daily work, routine, service, self improvement, duty, and employment. Virgo is practical, analytical, and loves when there’s a system in place. Virgo is all about working smart, hard, and efficiently. In business, Jupiter rules visionary thinking, marketing, and public relations. Get comfortable with making detailed plans, lists, outlines, etc. Virgo likes order and efficiency, and it loves having a task to complete. Write out your vision for the next 6 months, 12 months, and years ahead. Don’t be afraid to describe the nitty gritty. Get granular. When it comes to planning how you’re going to achieve those goals, you have to have a daily schedule to follow. Tinker with your schedule and determine what works best for you. Taking care of the little things every day will yield the biggest rewards. If you’re looking for a way to get organized, look into the Passion Planner. You can do all the planning in the world, but nothing beats putting in the work needed to get the job done. As I said before Jupiter will bring you many opportunities, but it’s up to you to take them and work for them. Look for some productivity hacks and implement them. Doing the work is the goal. Health and nutrition fall under the domain of Virgo. Are you working out regularly? Are you eating a balanced diet with lots of veggies and fruits? Do you make your self-care a priority? Making time to stay healthy will help you keep up with that demanding schedule you’ve created for yourself. Use the energy of the next 12 months to build a better body so you can get more done. Let’s face it: Virgo is picky. So why spread yourself paper thin trying to do everything under the Sun? Choose a few projects or endeavors to focus your attention on. Pick a core group of people to serve as a business owner or to have around you as you progress in your career. Not every opportunity is a good one. It can be tough to turn an offer down, but having a focus for your work is essential to being the best. This Jupiter cycle is begging for you to put what you know down on paper–or screen–so people can buy it up. Jupiter rules publishing, literary efforts, and disseminating information on a global level. This is a fabulous time to crank out that book, course, novella, or whatever that you’ve been dying to do. 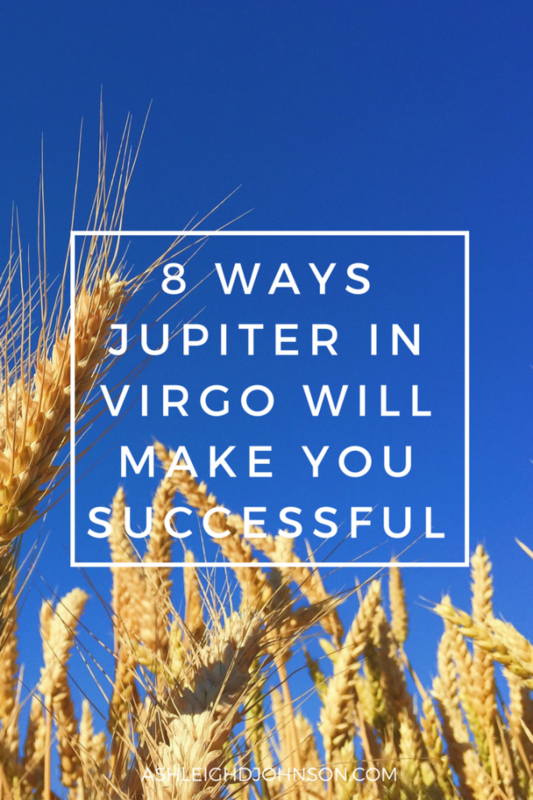 Jupiter in Virgo is a time where the work you put in can result in a great deal of financial growth and prosperity. Virgo represents the time of the year when you reap the harvest. Harvesting is rewarding when you’ve watered, weeded, and tended to your garden daily. If you want your bank account to grow, you have to water it with consistent effort. During Jupiter in Virgo, you may find yourself working so much that you don’t spend much money. If there’s a financial goal you’re trying to reach (paying off debt, making a big purchase, saving for a trip), this is a fabulous time to use the self-discipline Jupiter in Virgo is providing. Jupiter is in Virgo from August 11, 2015 until September 9, 2016. Jupiter in Virgo must be the reason we just met on the 22nd–and thanks very much for the resources…Looking forward to working with you this year–already referred you to a dear friend who is going to rock your world with interest and connections–well, frankly, I think there will be lots of ROCKIN on both sides. Looking forward to all the wonderful abundance of the coming year –and working with you to unlock it.